Please attend the Central Omaha Transit Alternatives Analysis public meeting this Tuesday, Dec. 3, 5-7 pm at the Mutual of Omaha Auditorium. 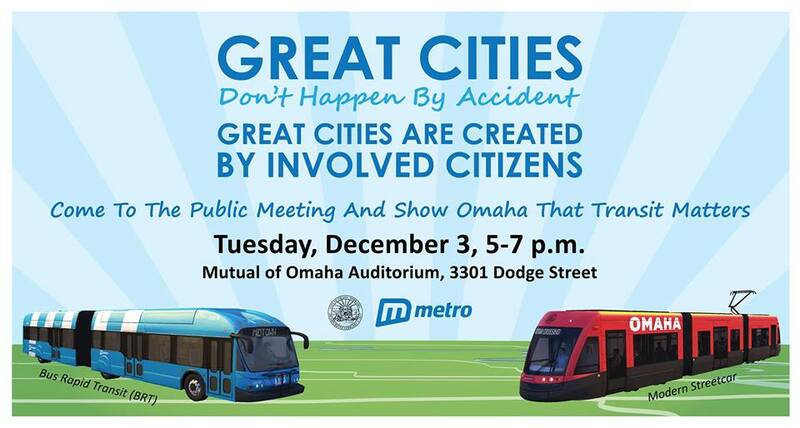 This meeting is important to attend because it will provide an opportunity for residents to have a say in improving the system and show there is support for better and more public transit in Omaha. We’ve made the case before for the many reasons to support public transit (see here and here). To see a summary of information about the alternatives (Bus Rapid Transit and Modern Streetcar) and to post questions before the meeting go here. The Alternatives Analysis focuses on the Central Omaha corridor but serves as a key part of the broader Regional Transit Vision being created through Heartland 2050. We also encourage you to get to the meeting via carpool, human power, or public transit. Two groups will be cycling to the event, one leaving from the Omaha Bicycling Co (60 & Maple) and one from in front of Legends Comics and Coffee (52 & Leavenworth) at 4:30pm.